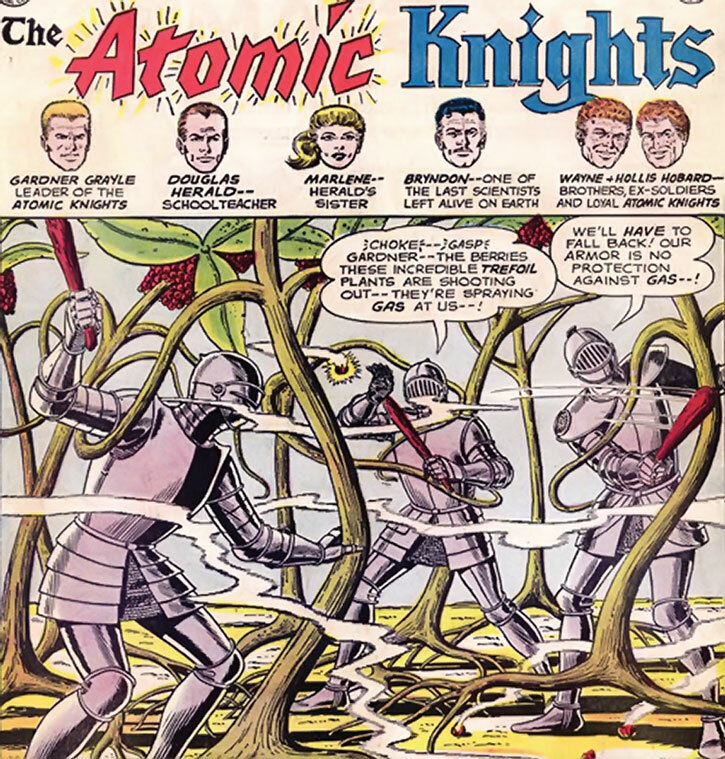 This team profile is about the Atomic Knights as they appeared during the 1960s, in DC Comics’ Strange Adventures anthology comic. These stories were a bit of an odd duck, as a sort of hybrid precursor of the Silver Age of comics. Post-1960s material isn’t really explored yet. For instance, the 1977 Hercules Unbound material or the 1980s Outsiders version of Grayle aren’t covered. 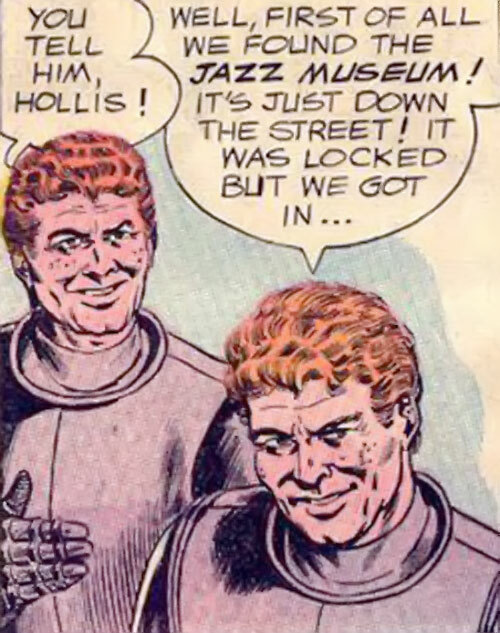 The 1960 Strange Adventures Atomic Knights stories were not intended to be set into any continuity but their own. But it is worthwhile to note that there *is* a continuity. 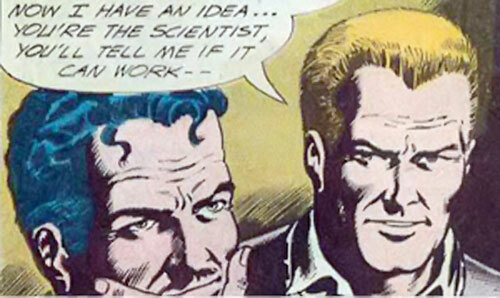 Strange Adventures normally presented short, one-shot features with a twist ending. By contrast the Atomic Knights were a continuing story, with a *setting*. In 1975, the Hercules Unbound series started pulling all sorts of old post-apocalyptic DC stories together. Now they all derived from a single event, the Great Disaster. 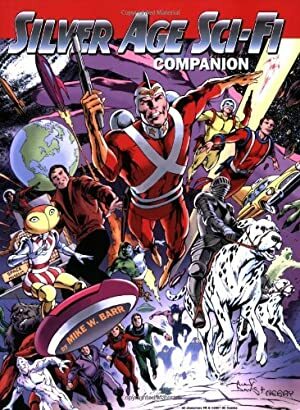 This tied, among others, OMAC, Kamandi, Hercules and the Atomic Knights. The Great Disaster was then attached to Earth-1. For instance when OMAC travels back in time and meets Superman, Kamandi comes into contact with the Superman legacy, and there is the whole imbroglio with the Sandman (Garrett Sanford). Thus the Great Disaster became part of the DCU’s future. Ever since the 1960 story it was stated to have taken place in 1986, but this specific date faded away as years advanced. Some important elements of Atomic Knights continuity, such as the bit with the mole people, also disappeared as time went by. In 1983, the Earth-1 Superman found out about the Atomic Knights. And, in a giant retcon , he discovered that their adventures were just a dream and simulation. A sergeant on Earth-1, Gardner Grayle, had been submitted to a VR simulation of a post-atomic future as part of an Army study. While in the depressing conditions of a realistic post-nuclear world, Grayle developed psionic powers, apparently from exposure to the suspended animation/sensory deprivation/VR system. Grayle reprogrammed the simulation to become the strange and uplifting tale of the Atomic Knights. When Army personnel tried to stop the study, Grayle subconsciously took over the facility and hypnotised them into forgetting about the project. 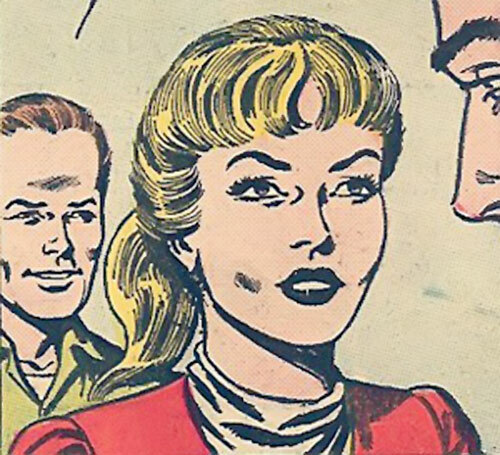 Grayle was attracted toward a project psychologist, Marene Herald. Thus, he dreamed up a duplicate of her in his fantasy VR world. As for the armours they were based on the experimental mechas developed as part of the project, which did look like gigantic suits of medieval plate armour. Superman discovered what was going on and stopped everything before Grayle would subconsciously trigger a nuclear world war from his suspended animation tank. The version of the Atomic Knights that is seen in this 1983 Superman story is the one with Hercules Unbound in it. This means that the Great Disaster being in the future of the pre-Crisis Earth-1 may have been retconned away at that point, with everything tied to it having been but VR simulation. Some years after Grayle was “freed” from his dream world, he became a real-life Atomic Knight. 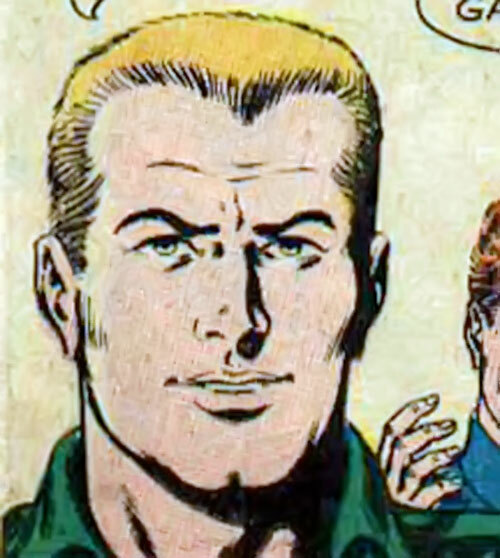 He wore an experimental, post-nuclear operations Army power armour, and joined the Outsiders for a short while. He also experienced visions of the future. This was in 1987, during the Millennium event and thus after the Crisis. This presumably means that the 1983 take on the Atomic Knights stories was the one that was true on “New Earth” – the unified, post-Crisis DC Earth. 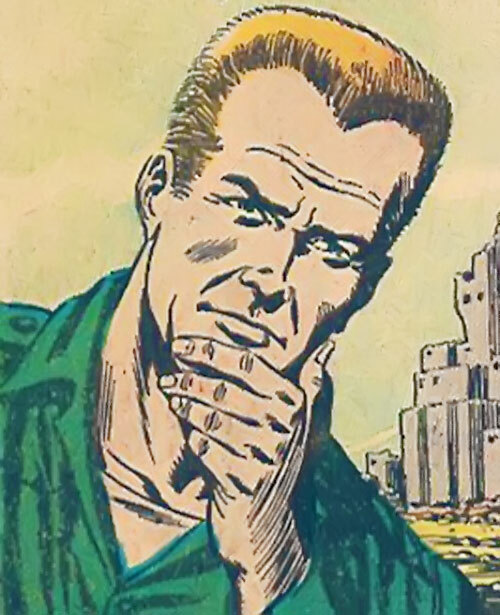 The main reason why the Atomic Knights stories disappear is that New Earth does not include the a Great Disaster in its future. There is, though, a kind of “smaller disaster” during the XXIst century, after which the futuristic part of Jonah Hex’s career occurs. Some Great Disaster stalwarts are still part of the post-Crisis DCU, but in a changed way. 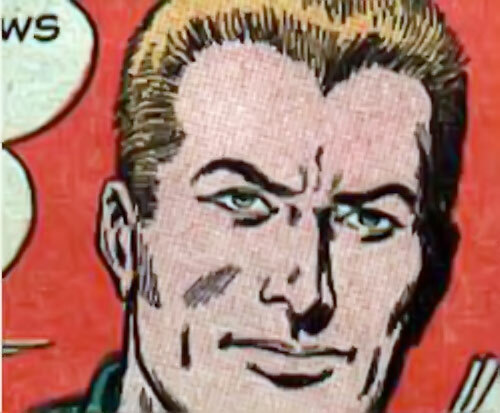 The boy who would have been Kamandi becomes Tommy Tomorrow, and OMAC exists in a future considerably more distant and somewhat different than his original World That Is Coming. No version of the Atomic Knights is mentioned in the 1986 two-issue History of the DC Universe, though. In 2006, on New Earth, an organisation called the Atomic Knights appeared in Blüdhaven after this city was destroyed. The similarities were numerous. 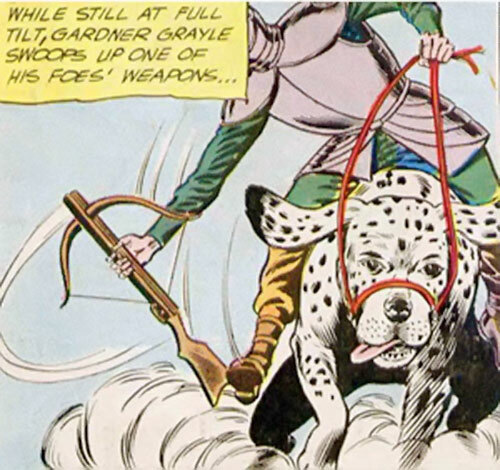 They have a sergeant named Gardner Grayle, a member named Marene Herald, giant Dalmatian mounts, post-apocalyptic decor, etc.. Since Hypertime was still the official framework back then, the simplest explanation is an Hypertime overlap. 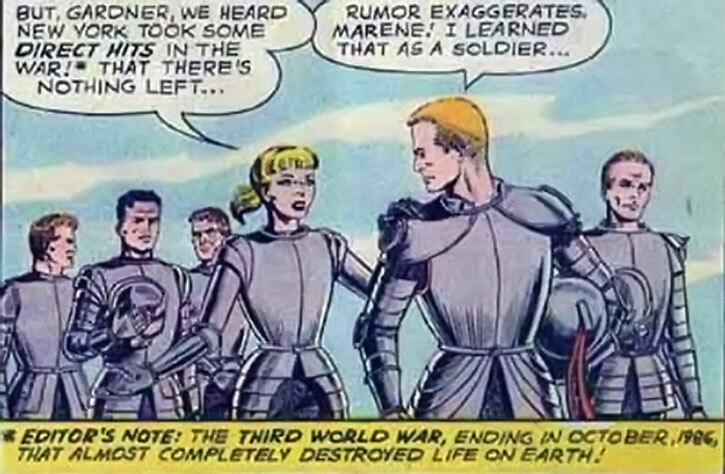 The Atomic Knights likely existed somewhere in Hypertime, and their reality “imprinted” on the DC Earth. After the 52 crisis, we get a glimpse of some of the 52 parallel Earths that make up part of the revised cosmology, Earth-17 looks like the world of the original Atomic Knights, or perhaps the unified version of the Great Disaster seen in Hercules. How similar it is to those continuities is unknown, and likely to remain so — until your campaign visits Earth-17 (or starts there !). 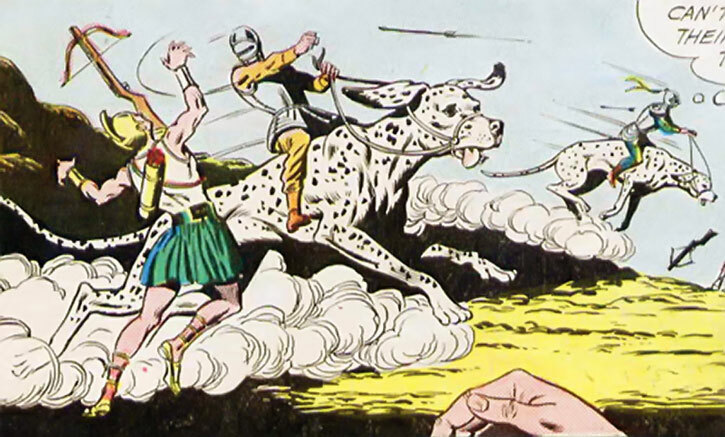 In the short glimpse in 52, the Dalmatians did not quite look like dogs (they seems feral, more reptile-like, and mutated), the Knights had deadly-looking polearms and the ruins were more sinister than anything seen in the original series. Further reality reboots ensued. I stopped paying attention. 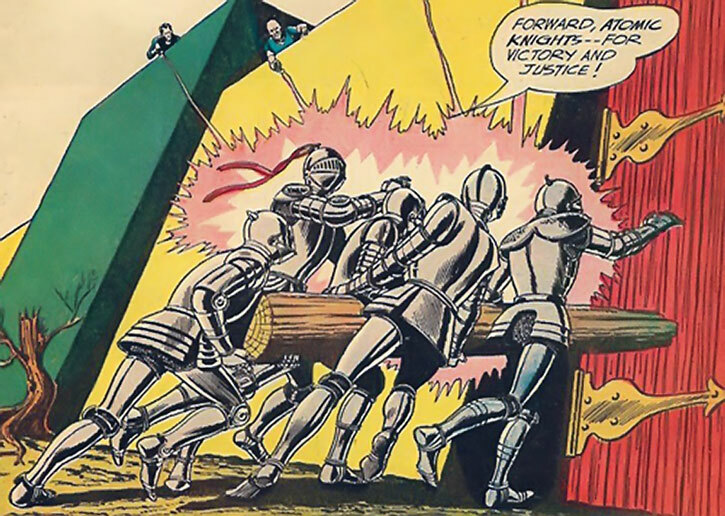 The Knights are intended to be ordinary Americans, though competent and determined to stand for what is right. During their adventures, they became experienced adventurers, and each brought their special abilities such as scientific acumen, military experience, survival skills or being a girl. The main asset of the Knights are of course their armour. 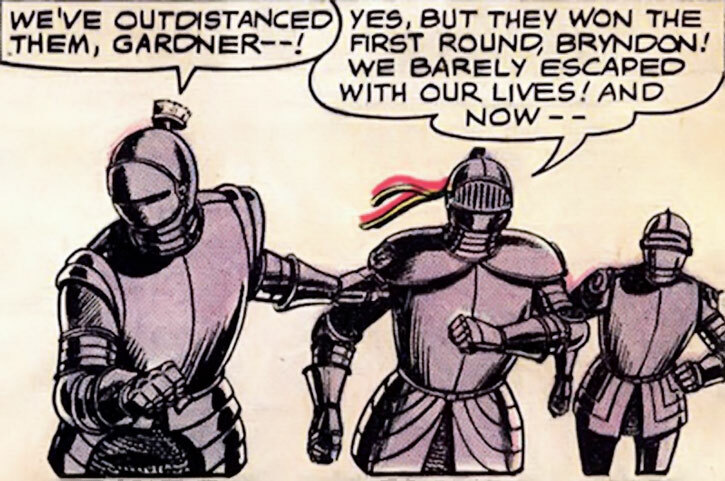 Those suits are medieval or Renaissance full plate armour, big and heavy. Somehow, the metal altered over the centuries then transmuted during the atomic war, and became able to withstand the radiation bombardment of modern weaponry without harm to the wearer (barring prolonged exposure). Some aliens called this unique form of metal “zaxion”. Their armour makes the knights very resilient to most attacks (in DC Heroes terms it’s rare for them to face EVs above 05), and the plated gauntlets punch pretty hard. This usually means they can hurt their opponents, but their opponents can’t hurt them back without some extraordinary measures and/or lucky strikes. One exception has been crossbow bolts, the reasoning being that those were “historically designed to defeat heavy armour”. Somehow, those bolts can also knock the Knights down. Crossbows have unusual characteristics in their reality. The Knights practically never go armed. Perhaps they prefer to leave the weapons to the Durvale rear guard. When fighting many enemies they occasionally carry clubs (in DC heroes terms EV 03, possibly more with STR and/or Martial Artist), but they usually just punch opponents. A handful of raygun pistols, very low on ammo [BODY 03, Energy blast: 08, Ammo: a few shots, R#04], from the Black Baron’s men. The last raygun becomes empty after the Knights return from Atlantis, but they acquire a pair again in Detroit. An old .308 rifle [BODY 03, Projectile weapon: 06, Ammo: 10, R#04]. A rebuilt 1940s hot rod, converted to run on atomic power (one raygun Ammo can make it run for hours). Later, they are given the first auto produced in Detroit since the war, which runs on mutant trefoil essence. A food-pack detector (like a metal detector stick, useful to find food packs buried in soil and/or ruins). Plenty of Anti-H pills, and a precious stockpile of matches. High-output signal flares developed by Bryndon after the battle in Washington. These are carried by all Knights to alert each other when they are separated. Two gliders. Originally 2-person affairs, they later became 3-person crafts, and got waterproofed. These gliders could cross half the Atlantic and even perform a transcontinental flight above the US. The Knight always managed to lift-off in the morning – the glider are mounted on a ski and can slide downhill until they get enough lift. An “omega circuit” which could get a live feed from spy satellites. A large, robust wooden flatboat which was used to navigate the Mississippi. 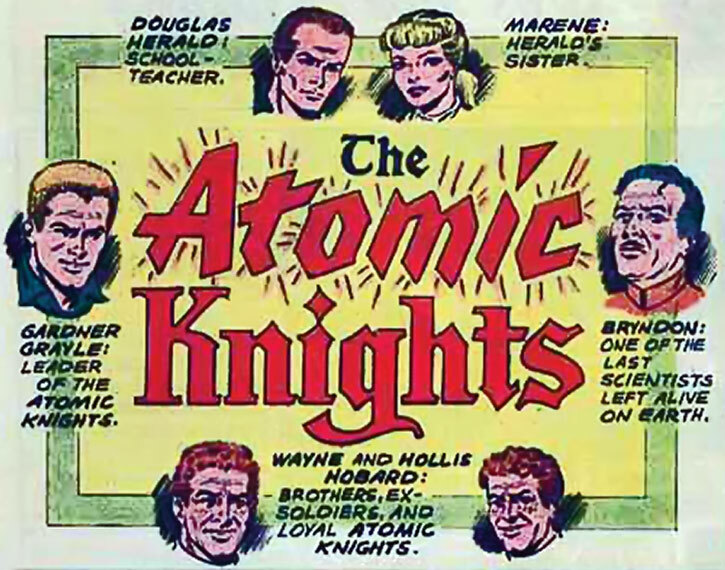 The Atomic Knights originally appeared in a continuity of their own, though their tales would influence later continuities. Those tales were written in 1960, and concern the distant future of 1986, when World War Three erupts. WWIII only lasted for 20 (or maybe 18) days. “Super-H” explosions devastated everything, even changing the shape of the continents. Plant and animal life was exterminated and only a modest number of humans survived, presumably thanks to bunkers, shelters and Anti-H pills. The geography is really, really changed. The ruins of New York City are not too far from a place that was once a salt lake, for instance, and from the Mississippi. Generally, it seemed that everything East of the Mississippi now existed in a much smaller land area. After some years, it was discovered that some hardy insect species, such as fireflies, had survived and they somehow bounced back to reconstitute their population. The civilisation of 1986 was quite technologically advanced, at least in the US, though many details looked surprisingly like 1960. Still, the soldiers of 1986 had rayguns, and the Super-H weapons of mass destruction could wipe out major landmarks and all unprotected life for miles and miles. Firearms were already considered a thing of the past, no longer widespread. Our tale starts as one amnesiac man is chased by an enraged crowd. After he loses his pursuers, the fugitive remembers that he’s Sergeant Gardner Grayle. Grayle had his 15 minutes of fame when a study among the military determined he was exactly average, mentally and physically. 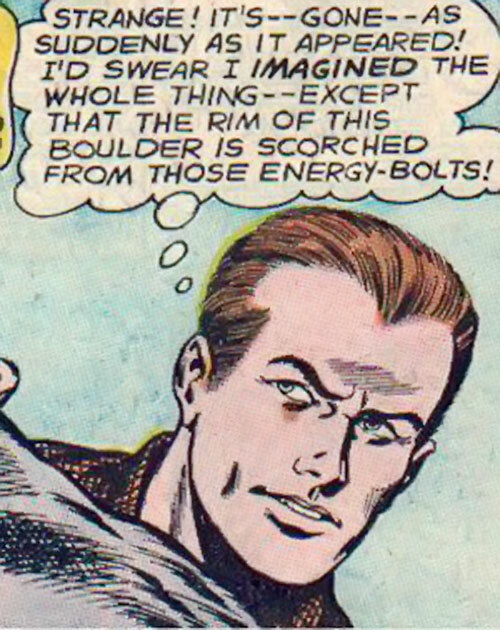 Grayle eventually remembers being in a bunker, losing contact with the external world as Super-H explosions wreck havoc. He was then knocked out as his bunker got hit. How long he remained knocked out and/or amnesiac, and how he survived this time span, was never quite clear. Grayle soon ran into another man being harassed by a small mob — Douglas Herald, a schoolteacher. Herald told Grayle that he had been attacked since, like Grayle, he held a food can. With the lack of plant or animal life, growing food was impossible. But a man called the Black Baron had taken all the food stocks in the valley at gunpoint, coercing everyone into obedience. 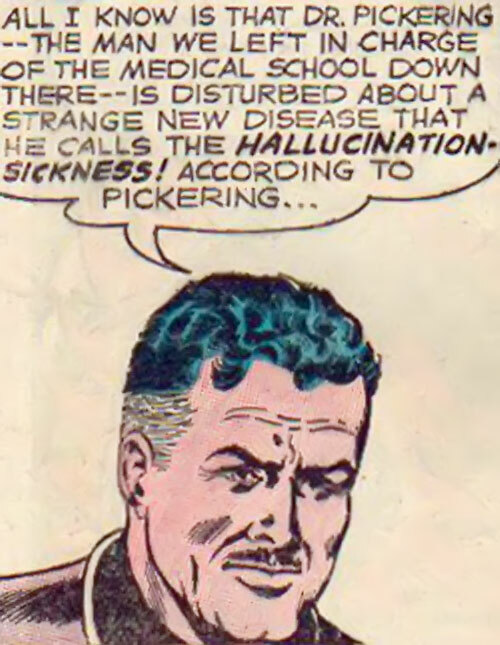 Herald explained the general situation to Grayle, noting that it was common for people to experience amnesia after the war due to the shock. After the mob lobbed a R-grenade at them, the two men dove behind antique plate armour on display for cover. Impossibly, they survived. They theorised that the metal of the armours must have been affected in such a way as to become radiation-proof. Those armours could allow them to fight the Black Baron’s men whilst ignoring the blasts from their rayguns ! Grayle and Herald took the armours with them. They then recruited 3 volunteers among the local community — they had six suits of armour, but the last was too small to fit a modern full-grown man. The knights marched on the Baron’s castle, rammed open the gate using a trunk, and punched out their opponents. Near the end they realised there were actually six of them. 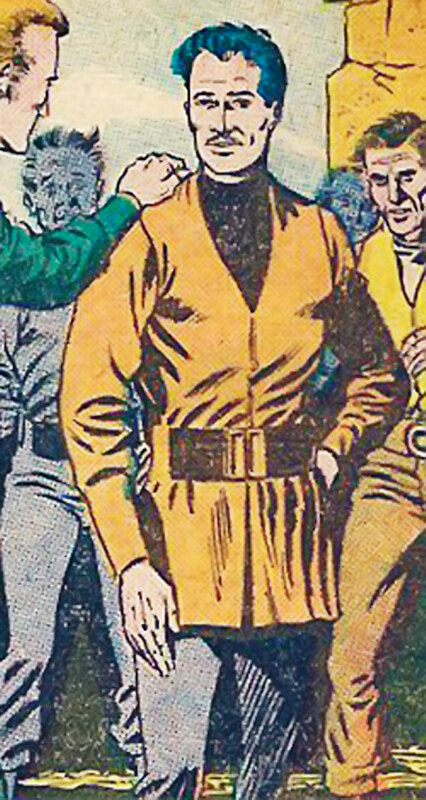 Herald’s sister Marene had discreetly taken the smaller suit and joined them, because every group of doughty 1960s comic book adventurers needs its girl. The Atomic Knights were born, and the town of Durvale was free ! It soon became their headquarters, as the Knights and the locals, now fed, cleaned the ruins up and built better shelter. A kite then arrived, bearing a message requesting help. Three Knights rode a recently-rebuilt car until they found a community near the remains of a salt lake. The small village was close to death due to a gigantic salt creature destroying all the water to sustain itself. The Knights dug up some more water using raygun blasts, then mixed it with red limestone full of calcium carbonate. When the salt creature absorbed the calcium carbonate, it was petrified. Another victory for the Atomic Knights and for science, and another community saved ! Our fearless heroes then walked to New York City to investigate and salvage the ample resources stockpiles there. As they explored a shelter, they stumbled upon tribals somehow devolved into “Cro-Magnon people” by Super-H radiation. After having the Cro-Magnons recover their memories as modern sapiens sapiens, the Knights decontaminated their signature armours. They left with gifts from the stockpiles — and the satisfaction of having again helped mankind. Grayle then decided to forge westward. 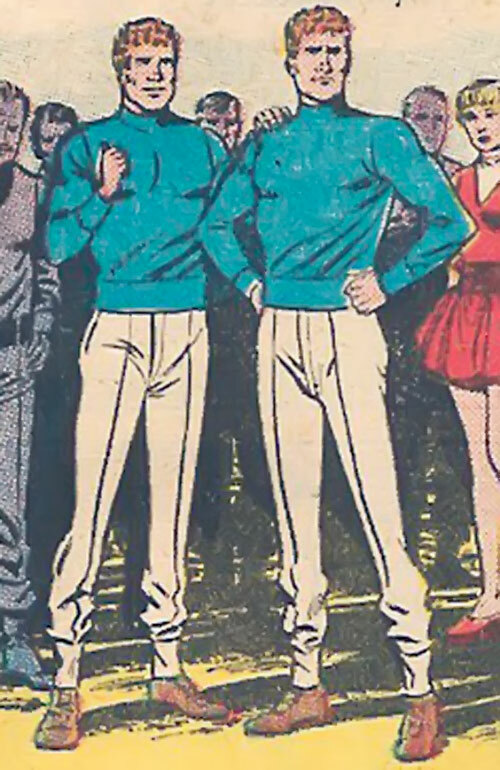 The Hobard brothers, being former glider champions, built a pair of gliders. Four knights spent days flying over lifeless, devastated countryside and ghost towns. Eventually they reached the Rockies, only to discover it was now a gigantic belt of fire-spewing volcanoes. Flying over, they found survivors in Los Angeles, but these were starving and hostile. Exploring Laurel Canyon, the Knights discovered that the food stockpiles there were blocked off by some sort of electric giants. Grayle deduced that the giants were hallucinations and the Knights brought stocks of food back to L.A.. Bryndon then built a radio, allowing the L.A. community and the Durvale community to stay in touch. The Laurel Canyon phenomenon was apparently observed elsewhere and became known as radiation mirages. Bryndon also built a receiver to get real-time video from spy satellites untouched by the war. Amidst the images of devastation came an oddity. There was an island that should not exist right in the middle of the Atlantic, covered by vegetation ! The Knights launched an expedition. It was apparently the Atlantis of myth, which had been catapulted 10,000 years in the future after an experience with a cobalt bomb went awry. The island thus reappeared in 1990. Since it did not exist during the war, it had been spared by Super-H radiation, but was walled off by fields of cobalt radiation. With their suits of armour, the Knights could cross the field. Thus, they discovered the Ancient-Hellenic-looking city there. Albeit captured and imprisoned by the guards, the Knights escaped during a strange earthquake. At the culmination of the earthquake, the island ceased to exist, perhaps because it was flung further into the future. This adventure had been critical, though. During their stay on the island, Marene Herald had grabbed a number of fruits and seeds. This incalculably valuable loot could recreate agriculture in Durvale and beyond. A bad guy called Kaghan (occasionally Khagan) and a crew of Atlantides had remained behind. After sailing to America, the Atlantides established a small colony and plotted to destroy the local leaders. Meanwhile, the precious seeds Marene had taken were planted. Bryndon decontaminated the ground and greatly accelerated the growth of the plants. Soon, Durvale had trees growing and its citizens were eating apples and the like. However Atlantide soldiers found Durvale and attacked with sun-powered beam weapons. The Knights rushed to their armours and defeated the soldiers. Douglas Herald was wounded by the sun-weapons, but he eventually recovered. One of the Atlantide prisoners, a fellow named Dalas, turned against the others as he thought Kaghan was evil. He agreed to help the Knights and took them to the Atlantide base in Washington, D.C.. There, they destroyed a super-weapon aimed at Durvale. While investigating reports of damage to a field, the Knights later discovered a rocket familiar to Bryndon. This upper atmosphere exploration module had been launched above the North Pole to determine whether a radiation field there was harmful. Its payload included two Dalmatian dogs. Soon, they found and captured the canines. Aside from being the first living animals seen in America since the war, they were now horse-sized ! When Kaghan’s men attacked anew, Grayle scared them off with a raygun (which was actually out of charge). But the Atlantides now had crossbows which were dangerous for the Knights. Grayle thus came up with a plan. After having the dogs follow the trail of the enemy soldiers, they rode them into combat. The great speed of the giant canines made them too hard a target for the crossbowmen. The Knights grabbed unused crossbows to threaten the Atlantides with, and thus won. Though the villagers had regarded the dogs with some hostility since they had to be fed, the pair of giant Dalmatians became very popular after the victory. 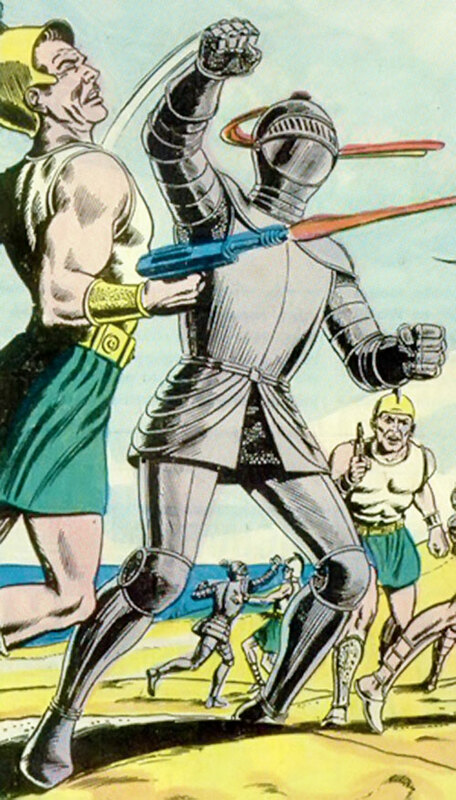 Alien conquerors then landed (it’s Strange Adventures – Earth is invaded by aliens at least twice per issue). These newcomers discovered that the Knight’s suits of armour were now made of a metallic strategic resource – zaxion. The aliens captured Hollis and Wayne, but Grayle and Bryndon charged in on Dalmatian back, wielding cut-off sapling as lances. This unusual cavalry charge saved the day, and the aliens were routed and left Earth. At this point, the known survivors communities were linked by radio. Some events were held between cities. Five years after the war the first meeting between the few surviving scientists was held near Durvale. The main pockets of radiation also largely receded, which allowed plant life to start reclaiming large areas. 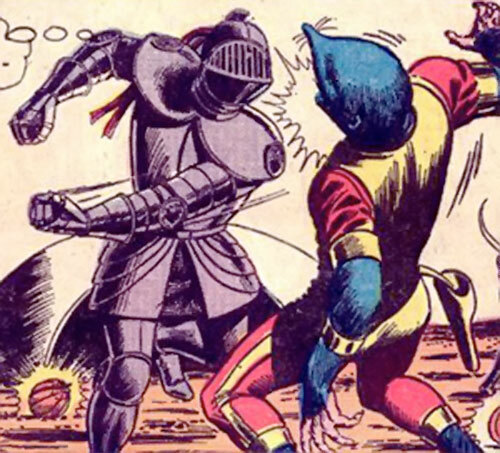 The Atomic Knight eventually determined the elusive cause of World War Three. As it turned out, a species of high technology mole people had been secretly sharing Earth with humans for millenia, hidden underground. The mole persons saw the arms race during the Cold War as their big chance to rule Earth. When the Super-H arsenals of 8 nations were in place, the subterraneans used their technology to remotely trigger the launch of the missiles. Five years after the war was over, they started sending scouting parties to the surface. Since they couldn’t withstand daylight, the scouts planted special shrubs which emitted a very thick, black smoke obscuring everything. They planned to cover the Earth with those to control the surface. The Knights found the shrubs, but the mole scouts had rayguns which could stun the Knights despite their armour. These weapons also came with an infrared sight allowing them to shoot sources of light used to blind them. The Knights retaliated with Halloween-style pumpkins filled with fireflies, whose cold light could blind the mole persons but could not be seen in the infrared. The moles were thus routed and the Knights finished burning the smoking shrubs. The Knights next worked on having more physicians among the communities, lest disease imperil the fragile rebirth of society. According to their data, New Orleans likely was the least-damaged major city in the US, and thus the most likely place where to find working hospitals and doctors. Building a flatboat, they navigated down the Mississippi. As previously mentioned, post-war geography is really strange. Soon the Knights discovered that the Big Easy was governed by a tyrant and his militia of enforcers. The most critical resource, doctors, had been brainwashed using ultra-sound technology. But the Knights discovered that the sound of jazz music could disrupt this conditioning. 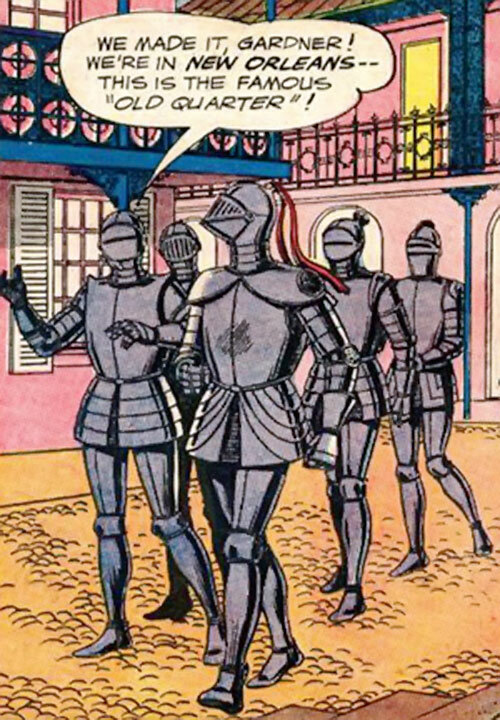 Forming a marching jazz band and using their fists, the Knights freed the doctors and overthrew the tyrant. They then helped restore New Orleans as a free, democratic society who would train many doctors and send them to allied communities in America. The medical school was named the Atomic Knights Medical School in honour of the liberators. The Durvale community then linked up with a nearby small community of survivors in Bedford, which included a botanist. The botanist discovered a mutant, giant species of bird’s-foot-trefoil which thrived on irradiated soil and had even become mobile. Furthermore, these plants were both intelligent and telepathic. Being generally subservient creatures, they were made to help in rebuilding Bedford. However, one such mutant plant in Durvale became accidentally convinced that the humans wanted to destroy them. It left to warn the others. The now evil plants soon formed an army, multiplying at great speed. They revealed that they could shoot explosive berries – and eventually poison gas berries. The Knights discovered that the mutant trefoils needed water like humans need air, and killed them by opening a dam, thus draining the marshy river bank the plants were standing on. The small printing press of Durvale printed many posters warning people against mutant bird’s-foot-trefoil — and eventually the Bedford botanist managed developed a non-hostile strain to act as servants of humanity. By 1992 the Knights and Henderson, the botanist, set up an automobile-building plant in Detroit, staffed by his trefoils. The mutant plants also provided the fuel, extracted from their berries. However, Detroit was also home to a fascistic-looking militia, the Blue Belts, under the authority of a man called Organiser Kadey. 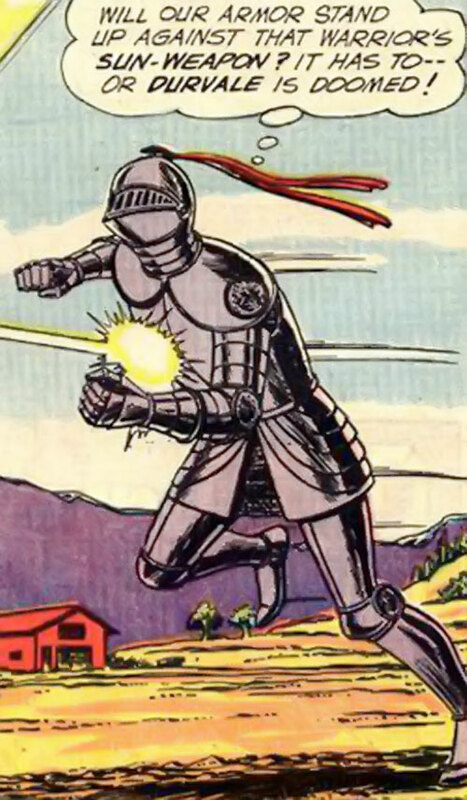 The Knights soon clashed with the Belts, and after learning Kadey had two working atomic rayguns, stormed his fortress. They confiscated the rayguns and let the Detroit populace restore democracy. Kadey and some of his men served time in jail, but disappeared after they were released. In the nearby community of Harrow, the Knights prevented the virulently anti-science locals from stoning a woman accused of witchcraft. With the help of the medical school in New Orleans, they discovered that the real culprits were radiation mirages like those in Laurel Canyon. The energy giants, apparently sapient , tried to keep the hallucinating person in their thrall to continue to exist. The Knights repulsed the giants then cured the woman, thus convincing the locals of the superior virtues of SCIENCE! The Knights then stumbled upon a wandering band of ragamuffins, who refused to settle and wanted to grow up to become outlaws and robbers. Wanting to get the boys back on the straight and narrow, the Knights disguised Marene as another wandering boy. Kadey also resurfaced, using experimental antebellum research to hypnotise the kids and create a new generation of Blue Belts. The Knights intervened and arrested Kadey. The boys decided they wanted to grow up to be like the Knights and not like the Blue Belts, and joined Durvale to be taught CIVILISATION! 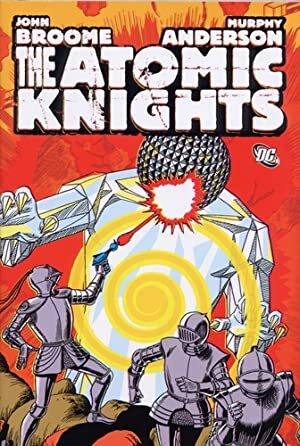 Though we were promised further adventures of the Atomic Knights, they never came in Strange Adventures. Greatest Generation brave and clear-eyed American heroes. They fight for the American Way, and science, and proper manners, and democracy and freedom and all the good stuff. The very last strip even made a visible effort to be less misogynistic. They are always resolute, well-groomed, dashing, courageous, etc. etc.. All situations are morally straightforward. They’re the white hats crossed with a gang of 1950s TV Dads. Headquarters (Expansive, the former castle of the Black Baron). Democratic survivor communities in America (Low). When exposed to heavy fallout for prolonged durations, the armours must be extensively washed lest they become dangerous to be around, let alone to be in. The ARMOUR does not give a penalty to most rolls (though apparently getting back up takes up a Dice Action if one is knocked down) – the Knights could even do some rock-climbing whilst in armour. 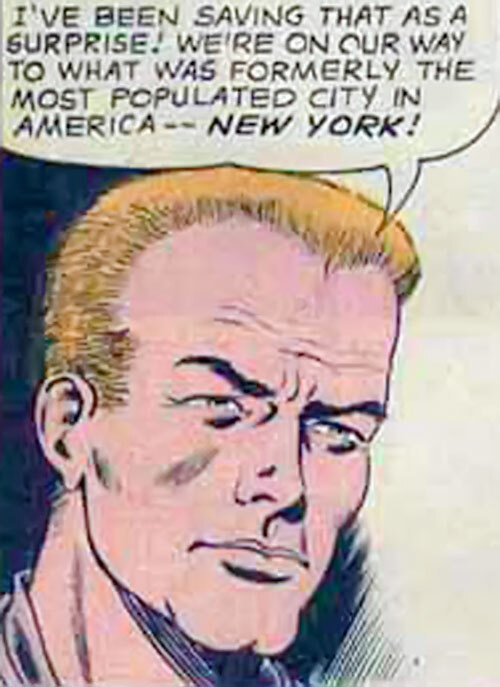 Gardner Grayle is the Leader (in terms of role, I mean — he does not have a huge green forehead). He has a DEX and BODY of 04, an INT, INF and AUR of 05, and 25 HPs. He also has a Familiarity with military equipment and protocols, a Familiarity with Chemistry, Weaponry (Infantry weapons): 04, Martial Artist: 04 and an Initiative of 015. Douglas Herald, the Firm Friend. He has an Expertise in Schoolteaching, and also in History. In particular he pored entire stacks of newspapers to reconstitute the full history of World War Three. Marene (occasionally Marlene) Herald, the Girl. She doesn’t get to fight because, duh, she’s a girl. STR 01, BODY 02 and cooties are possible stats. You can tell she has cooties because the guys practically always leave her behind when they go on missions. She’s Douglas’s sister and of course Gardner’s companion. Oh yeah, and she has Artist (Cooking): 03, obviously. Bryndon (occasionally Bryndam), the Keen-Eyed Scientist. He had Gadgetry: 06 and Scientist: 06, and he’s one of the last scientists left alive on Earth (many survivors hate scientists with a passion, for having invented Super-H weaponry). Also Vehicles (Land): 03, Martial Artist: 03 – and 025 HPs since he’s the co-star. 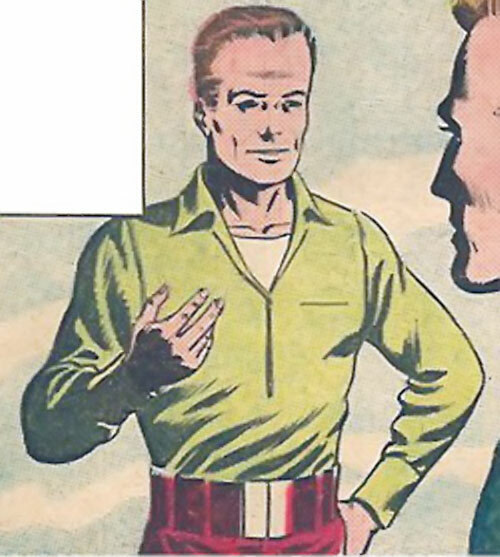 Before the war, Bryndon was head of research at the Farlin company, which apparently was into space exploration and a leading contractor in the US atomic program. Bryndon’s last name is revealed to be Smith in his Hercules appearance. Wayne and Hollis (occasionally Hollie) Hobard, the Loyal Followers. Ex-soldiers (scouts, to be precise), they have a Familiarity with military equipment and protocols, with Wilderness Survival, plus an Expertise in Jazz. They also have Vehicles (Glider, Flatboat): 05, which includes knowledge of how to build gliders and flatboats, plus Martial Artist: 04 and Artist (Jazz musician): 03. Running is reduced to 04 when carrying two riders. 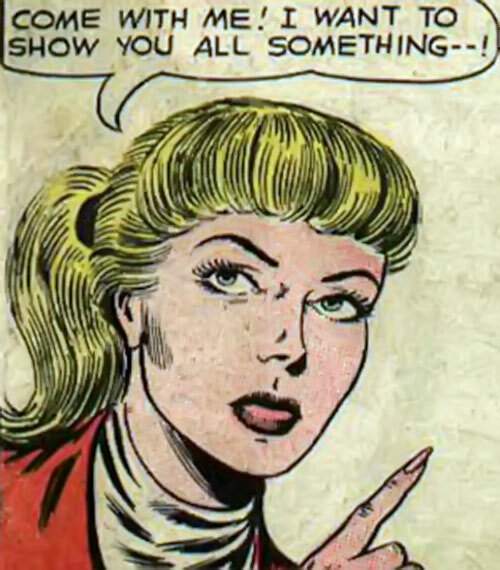 Source of Character: Strange adventures issues in the early 1960s, published by DC. Though back then the strips were not usually credited, those adventures were written by John Broome (also a classic Flash writer, the daddy of the Elongated Man and the writer of New Look Batman) and illustrated by Murphy Anderson. Helper(s): Darkmark’s site for referencing the issues ; WORG’s animals file ; Darci.